Whether you're in charge of transportation for a school or just need to get a class of students to a museum, Eagle Bus Service has a solution for you. Our rates are low making our school bus rates up to 50% less than the cost to rent a coach bus. 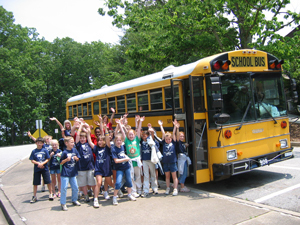 For a variety of groups and trips, a school bus is the perfect transportation option. Our customers continually tell us how the money they saved went directly towards enhancing their main event. Find out what you don’t know about school bus ridership. Learn the facts and play it safe. Visit schoolbusfacts.com for more information.